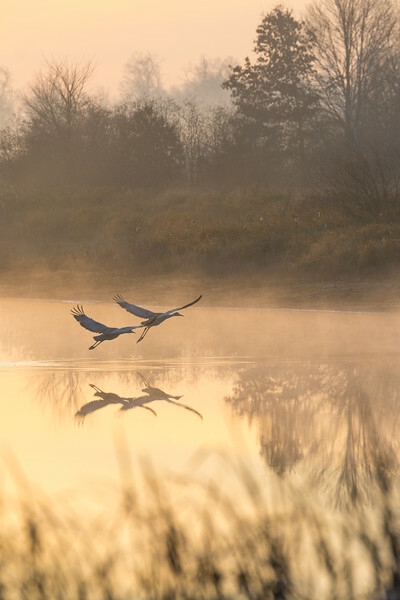 Two sandhill cranes take flight to the other side of a stream bank. These birds depend on the protection of wetlands like the ones at Crex Meadows State Wildlife Area to roost and nest. Protection of these environments is imperative to the success of sandhill cranes and many other species. In the 1930's, during a time when wetlands were drained for agricultural purposes, as few as 25 breeding pairs remained in Wisconsin. Now, the total Eastern Population of the Greater Sandhill Crane, including all of the Sandhill Cranes in Wisconsin, is estimated to be between 60,000 and 70,000 individuals.